young adult – Ginna Moran—Author of Young Adult Paranormal, Fantasy, Contemporary, and..,Your Next Book Boyfriend. I posted this bonus scene a few months ago in one of my newsletters and thought I’d post it to my blog as well. The scene is from a day in the life of Cadence while she was busy hunting with Cami during the time between Crushed and Haunted. Be warned, it contains spoilers for Crushed, so do not read if you haven’t read Tainted or Crushed. Since the scene is six pages long, I’ve included it as a PDF. Enjoy! Music has been an important influence on the Demon Within series, helping me get into a specific mood to be in Cami’s mind, which isn’t always—actually mostly isn’t—a bright, sunny place. She goes through several devastating circumstances through the series that change her, which changes the feel of the each book. Scorned was a particularly hard book to write because Cami struggles with everything that she is—everything she thinks is wrong with her or everything wrong that has been done to her to put her in the situation she’s in. There’s a particular feeling I felt throughout writing Scorned, and I wanted to share the music that helped me capture the essence. I hope you enjoy my compilation. This song would be the theme song for Cami in Scorned. (Spoilers ahead) As you know if you’ve read Haunted, Cami gets pushed to the point where she no longer cares. In Scorned, Cami learns what it’s like to feel again, and the feelings push her toward change. This song reminds me Cami’s darkest moments in the series. She spends a lot of time wondering why things are the way they are, and her silent questions that never receive the answer in the way she wants, leave her feeling more alone than ever. This song encompasses the lighter, feistier moments with Cami. It’s a song she might listen to in her Mustang while flying well over the speed limit with Evan in the passenger’s seat. It’s perfect to describe the heat (pun intended) of Cami’s and Evan’s relationship. “I got my mind made up and I can’t let go. I’m killing every second ’til it sees my soul. This song captures how much Cami tries to hide and control her emotions when they threaten to ruin her, especially when it comes to her relationship with Evan. The final song in my short playlist is Empty Apartment. The song captures Cami’s relationship with Dylan and how Dylan wants nothing more than to help Cami in her loneliest, darkest moments, where she doesn’t know what to do or how to feel. He’s willing to risk his own heart even if she could possibly break it. Thanks for reading! I’ve included my youtube playlist if you’re interested in listening to any of the songs. I was so excited to receive an ARC of The Lovely Reckless months before its release, and I devoured it! The novel blew me away! It follows Frankie Devereaux, a teen girl whose boyfriend is brutally beaten to death in front of her, as she gives up her old life of wealth and riches after making a mistake that gets her kicked out of her prep school. Forced to live with her undercover cop father and go to a new school vastly different than her private school, Frankie falls into a world of street racing, fights, and everything that encompasses hot, irresistible bad boy Marco Leone. Beautifully written, The Lovely Reckless captured the perfect amount of action, love, grief, and self-discovery. It lingered with me for days as I reveled in the love story of Frankie and Marco. It was one of my favorite young adult contemporary romances ever. I just loved the development of Frankie’s character and her growth throughout the novel. I loved how every relationship played a role in who she was and was becoming from her strained relationship between her parents, the forced friendship with her best friends, to the new unexpected relationships in the people she’d have never associated with if she were the same Frankie before the death of her childhood friend and boyfriend. But the story wasn’t all love and moving forward through grief, it was action-packed and exciting with some mystery. It had all the things I love in a novel. If you enjoy stories about love and loss, are a fan of street racing movies like The Fast and the Furious, like young adult contemporary romance, and novels with diversity, The Lovely Reckless is for you. Buy links: Amazon, Barnes and Noble, iTunes. Kami Garcia is the #1 New York Times, USA Today, and international bestselling coauthor of the Beautiful Creatures and Dangerous Creatures novels. Kami’s solo series, The Legion, includes the instant New York Times bestseller UNBREAKABLE, and the Bram Stoker Award nominated sequel UNMARKED, both of which were nominated for Bram Stoker Awards. Her forthcoming YA contemporary romance THE LOVELY RECKLESS releases on October 4, 2016, followed by THE X-FILES ORIGINS: AGENT OF CHAOS, an novel about a teenage Fox Mulder, in January 2017, both from Imprint (Macmillan). BEAUTIFUL CREATURES has been published in 50 countries and translated in 39 languages, and the series has sold over 5 million copies. BEAUTIFUL CREATURES was a finalist for the ALA’s William C. Morris Debut Author Award, a SCIBA Award Finalist, Amazon’s #1 Teen Book of 2009 and #5 on the Editor’s Top 100 List, a YALSA “Teen Top Ten” Pick, and a New York Public Library’s “Books for the Teen Age” selection. The film adaptation Beautiful Creatures released in theaters in 2013, from Warner Brothers. Kami has an MA in education, and she was a teacher for seventeen years before co-authoring her first novel on a dare from seven of her students. If she isn’t busy watching Supernatural, Kami can teach you how to escape from a pair of handcuffs or bake a Coca-Cola cake. She has never raced a car, but there is still time. She lives in Maryland with her family, and their dogs Spike and Oz (named after characters from Buffy the Vampire Slayer). Visit Kami at www.KamiGarcia.com. Keep up with Kami and her books here: www.kamigarcia.com, Facebook: KamiGarciaYA, Twitter: @kamigarcia, Instagram: @kamigarcia, Tumblr: kamigarcia, & Pinterest: kamigarcia. 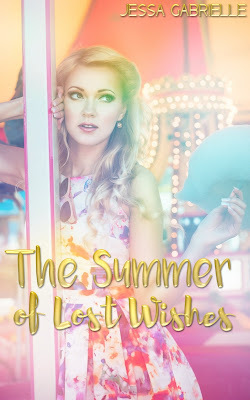 I’m super stoked to participate in this book blitz featuring Jessa Gabrielle’s debut novel, The Summer of Lost Wishes, because as soon as I discovered it, I knew I had to read it. And just as I expected, it was amazing. I also had the pleasure of interviewing Jessa, so you can find an author interview at the bottom of this post. What can I say? The Summer of Lost Wishes was the perfect book to kick off my summer. It had everything I love in a YA novel from teen angst to a hot boy next door and some mystery as Piper and her new neighbor Rooks set off to discover what really happened to the five teens who died tragically in their small beach town fifty years ago. Jessa Gabrielle does a stunning job at weaving the perfect beach setting, with incredible summery descriptions that really let me experience the small town of Coral Sands. The sweet, budding romance between Piper and Rooks had me smiling at nearly every page. There aren’t enough smiley heart-eye emojis in the world to describe how adorable every moment between the two of them was. Their summer love story was really well done. I also loved how some letters from the past were speckled throughout the novel to give us a glimpse at the teens’ lives from 1965 before the tragedy occurred. It set up the mystery of the story perfectly. I highly recommend this story for those who like young adult contemporary novels, beach reads, beautiful settings, and an all around cute romance. 1. First of all, I loved everything about this book—the mystery, the sweet love story, the setting—it was perfect. So, what was your favorite scene to write? Thank you so much! I really loved writing a particular conversation toward the end of the book where a lot of the mystery was revealed. It was a big moment because it’d been in my head for a year, so finally getting the words down was awesome. But since that would be a total spoiler, I’m going to say my other favorite scene, which was the county fair. The flirtation between Piper and Rooks was so much fun. I loved everything about that scene. 2. Piper Davenport has an interesting taste in room décor. Why faux deer heads? Is there a reason behind them? 3. What was your favorite quote from the book? 4. I know some people like to have playlists with their books. Any songs capture the essence of The Summer of Lost Wishes for you? I usually have pretty in depth playlists for my projects, but this book only had a few songs on it – “Teenage Dream”, “The One That Got Away”, and “Thinking of You” by Katy Perry and “Shut Up and Dance” by Walk The Moon. 5. Will you ever visit Coral Sands again? I told myself I wouldn’t when I started writing the book, but I have a terrible, terrible habit of going back and revisiting old places and old characters, so it’s possible that Coral Sands will pop back up. 6. Can/Will you share anything about future projects? My next book will be a YA contemporary romance called Fireflies, Sandcastles, and Other Remnants of Summer. Thanks so much for the interview, Jessa! I had so much fun reading TSOLW! Jessa Gabrielle is a young adult author who lives in the land of salt water, palm trees, and sandy shorelines. She believes that summer love is pure bliss and that she was a mermaid in a past life. The Summer of Lost Wishes is her debut novel. With the release of Stolen from Me upon us, I figured I’d share what I loved about the next part of Nate and Mira’s journey as they figure out their place in the creature and Human Preservation Agency world. Good versus evil is a running theme through my novels, and while things have never been clear or black and white, Stolen from Me shines a light on good and evil within a person and how they handle it. I loved writing Stolen from Me and exploring the darker sides of my characters. With Nate Burnham, the Human Preservation Agency altered him into a killer—or what Dr. Prudence referred to as a “better killer” since he was capable of murder before the HPA brought him in as we saw in the beginning of Altered to Kill with the incubus. Stolen from Me focuses on Nate’s struggle with trying not to kill and learning how to survive in what he thinks is a kill or be killed world. On the other side of things, Mira Everson has been quite the opposite of Nate. As an enchantress, she’s innately benevolent, and she encourages Nate to be the boy she fell in love with. Unfortunately, she finds herself in a downward spiral as she starts to recognize the real evil in the world. She battles with her humanity and starts to question if it’s worth being good when the bad guys seem to always win. Out of all my characters, Mira has the biggest transformation which you’ll see in the second installment of the Finding Nate series. Apart from what I loved exploring with Mira and Nate, I figured I’d share a few more fun facts and tidbits to watch out for while you read. Stolen from Me was the book that sparked the idea for the Destined for Dreams series. It was written before all three books and stories, and I went back and rewrote Stolen from Me after the fact to tie things into the Destined for Dreams series. You get to meet one of my favorite characters in Stolen from Me. His name starts with a T, and I’ve considered giving him his own series. I introduce a creature I’ve never written about before. Dreams are pretty prominent in all of my books, whether or not there’s a nightmare inflictor involved. I love the unexpected side effects caused by Nate giving Mira a fresh start in Altered to Kill. The scenes capturing his reactions were interesting to write. If you’ve read Destined for Dreams, you know the connection Nate shares with the Creature Council. Nate is the last one to know. Creatures on the west coast tend to be more aggressive because they haven’t had any sort of Creature Council protection until recently. I’m not able to share my favorite quotes because they contain spoilers. Some of Evie’s old friends make an appearance. I hope you look forward to reading Stolen from Me! You can pre-order today or purchase your copy on April 12th! Halfway There is a cute, quick short story that picks up halfway between Falling from the Sky and Crash Landing, a series that follows Ridge McCoy and how he navigates his new relationship with Micah Youngblood, the boy who figuratively brought him back to life after he struggled when his father died in a plane crash. I loved catching up with Ridge and Micah in Halfway There as they take a short New Year’s vacation to none other than Sierra Springs, which happens to be the setting of Breaking Saint Jude, a book I recently read and loved by Nikki. I loved this! It’s like when two great books meet each other, and you’re reminded how awesome both are. I giggled excitedly with the cameo of Max and Jude (even though they remain anonymous to Ridge and Micah), and now I really, really, want a story to feature all of them. Nikki has a way with crossing over characters naturally, and it’s such a treat to experience. If you haven’t read any of Nikki’s books yet, you should! She writes such a variety of contemporary YA novels that I feel like there’s something for everyone. LGBT boyXboy, clean romance, surfers and sunshine, and even boy bands and adventurous summers. I highly recommend you read Falling from the Sky before trying out Halfway There. If you’ve read Falling from the Sky, then what are you waiting for? Also, read Breaking Saint Jude while you’re at it. Read my thoughts about Falling from the Sky and Breaking Saint Jude. What is there not to love about a story that follows a sassy, confident Gremalian teen on the hunt to find a boy who’s supposed to save her people in a war against Gobels? Nothing, really. I enjoyed every minute of Alyssum Bracken’s story. As a huge YA paranormal fan, it was quite the treat to stumble upon a novel with creatures I’ve never read about. Heather Young-Nichols does a fabulous job bringing to life such a sarcastic, funny, and rebellious female lead. Alyssum captured the essence of what it’s like stepping into adulthood by learning to make her own decisions when it comes to her life and what she wants to do. Apart from Alyssum, who was a great lead, I loved several other characters, including her love interests, Jensen and Aric. Heather crafted the perfect story between them that didn’t disappoint. I also felt for Alyssum’s father, the leader of the Gremalians, and thought his character perfectly portrayed what it would be like having to be a leader all the while wanting and needing to protect his family. I can’t wait to see what’s in store for his and Alyssum’s relationship. Another thing I loved about Grounded was the world building and how little pieces of Alyssum’s life and power were woven throughout the story. I liked how she knew she could stand up for herself, fight along with the best, and also not let others hold her back. It was refreshing. I highly recommend this story to those who enjoy YA paranormal romance, love triangles, unique creatures, a fierce and feisty female lead, and some hot book boyfriends. I look forward to the next book in the series! Get your copy of Grounded here. I’m so excited to finally share the cover and book blurb for my newest series, which is a standalone companion series to Destined for Dreams, called the Finding Nate series. Altered to Kill is a novel dear to my heart, because it’s what inspired my creature and Human Preservation Agency world. I hope you enjoy it and love the cover as much as I do! Seventeen-year-old Nate Burnham never thought killing would be easy, but when his girlfriend, Mira Everson, is attacked by an incubus disguised as a classmate, Nate discovers love is worth killing for. With the possibility of a grim future, Nate finds himself in the back of an unmarked van with a decision to make—spend life behind bars or enroll in the Special Abilities Task Force run by the Human Preservation Agency. In order to protect Mira, Nate joins the secret organization and is plunged into a world of monsters, murder, and secrecy. Mira Everson’s life is turned upside down when she discovers Nate has been abducted by scientists who have the ability to rewrite lives. She flees her home to escape a deadly agent sent to kill her, and she must come to terms with the idea that any future contact with Nate could result in her death. Thrust into a war between humans and creatures, Nate and Mira are fated to fight on opposing sides. Can they unravel the secrets of the supernatural world or will they face deadly consequences? I’m going to need a lot more than this dish rag and paper towels to clean up the pool of blood seeping from Ryder’s stomach. The puddle smears when I rub it instead of being soaked up like it should be. “Stop bleeding already, man.” I drop the dish towel, splattering blood on my shoes. “Where the heck is the mop?” I don’t know why I even ask. No one will respond. I wipe my hands on my jeans without thinking. “Oh, come on!” I’m starting to look like a murderer. Hate to break it to you, Nate, but your appearance is the least of your worries. I’m sweaty, have blood all over me, and I’m sure my eyes are wild. Think, Nate. Think. Think. Think. I growl like a rabid dog. “Why can’t you just go away?” I kick Ryder’s leg. “You piece of crap lunatic!” I kick him again. “You should be the one going to jail. You attacked my girlfriend. You held a knife to her throat. I heard you tell her how she didn’t deserve to live. How you were going to make her feel the pain she made you feel. But guess what? You did that to yourself. You knew she was in love with me. Mira is my girlfriend. Not yours. And if anyone should deserve to live, it’s her.” I kick him so hard his body rolls over. What the…? No way. Bodies don’t decompose this fast. Part of the skin on Ryder’s arm is blackening. It looks like it’s raw and melting away, yet Ryder has only been dead for just over an hour. I nudge his arm with the toe of my shoe and it deflates. I jerk back in surprise. It’s foul and intriguing. Does Hollywood keep this postmortem fact a secret? I never knew this about dead bodies. At least he doesn’t stink. Actually, he smells rather nice. Like cinnamon rolls. Man, I’m disgusting. Morticians have a lot of work to make bodies look presentable. If they threw Ryder in a casket now, it’d have to be closed. He’s nasty looking. But dang, his warm pastry smell is overpowering and making me hungry. I shake my head to regain focus, but I can’t. My stomach growls. Despite Ryder’s disgusting flesh, his scent is mouthwatering, and I almost want take a bite out of him. Almost. Now that’s one way to get rid of the body. I yank my shirt over my nose. This body cleanup business is ludicrous. I need to put him in a trash bag and somehow manage to get him in the back of my Ford Ranger without anyone seeing me. I kick the dishrag away. No point in trying to soak up the blood if Ryder isn’t going to stop bleeding and decomposing. The police would never believe this happened just over an hour ago. Maybe that would help my case. I can find an alibi for another day and time. I wonder if anyone would believe I just stumbled upon him. With the way he looks now, only a DNA test could determine who the body belongs to. He’s in your girlfriend’s kitchen. That still leaves her a suspect. I lean closer and closer. I can’t help it. I can’t do anything to stop myself. I have to taste him. One little bite won’t hurt. I grab his soft, slimy arm and bring it to my mouth. Don’t do it! This is disgusting. And crazy. And completely not something a normal person would do. Pull it together. Seriously, pull it together! My mind doesn’t want any part of this Ryder tasting, but my hands won’t drop his arm, and my mouth won’t stay shut. I’m really doing this. I’m going to take a bite out of a dead guy. I hope you enjoy Altered to Kill! You can pre-order a copy on Amazon!